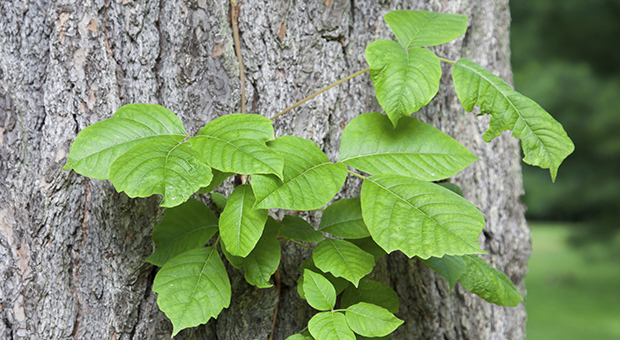 Dr. David Adams, a dermatologist at Penn State Hershey, doesn&apos;t buy recent news reports that poison ivy has become stronger and more prevalent lately. Although most people who contract poison ivy see their family doctor for treatment, Adams sees some of the more serious cases each summer, but the number or severity hasn&apos;t changed much in the past 15 years. He does see a few patients who get poison ivy during the winter holidays. The oil can remain on inanimate objects for long periods of time, so Adams recommends laundering clothing and cleaning garden tools after use. Now and then, he&apos;ll run across someone who has been exposed to poison ivy after using a chainsaw to cut down trees that have decades-old mature vines of the plant roping up the trunk. In other cases, people burning yard waste and debris make the oil become airborne, and exposure to the smoke can cause the whole face and any exposed skin to swell and itch. “The most common method, though, is that someone is pulling out weeds and then they rub an eyelid or something,” Adams says. Irritation and rash don&apos;t appear immediately, but take some time to incubate, depending on whether it is the person&apos;s first exposure. Initial exposure usually produces symptoms seven to 10 days later, while those who have had it in the past typically react a day or two after coming into contact with the plant&apos;s oil. Poison ivy is not normally passed from one person to another, nor by scratching areas that itch. Treatment depends on the location and severity of the reaction. For mild, localized cases, a topical treatment such as an over-the-counter cortisone cream or calamine lotion often works. When the itching is unbearable, it&apos;s time to see a doctor. More serious cases may require prescription creams or a two-to-three-week round of prednisone or other oral steroid.